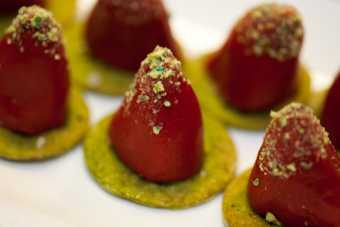 It’s a balmy autumn evening in Greenwich Village, and at the James Beard House on West 12th Street, one of Oregon’s finest chefs is setting out a plate of hot-and-cold smoked steelhead appetizers—morsels of pink fish resting on a dollop of yerba buena–infused crème fraîche and set atop little pancakes made with baked camas. 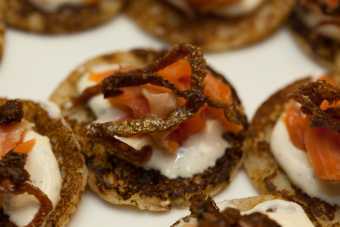 “Blini with lox,” he quips to a curious guest who, wine glass in hand, pauses to observe the preparations. Chances are you’ve never heard of this chef. 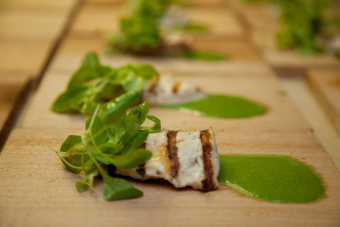 Nor are you or the diners here in the temple of American gastronomy familiar with the food he is showcasing this night. Matt Bennett does not cook in Portland—or Ashland or Astoria or Dundee or Eugene, for that matter. He is the chef-owner of Sybaris, a small restaurant on First Street in Albany, and the meal he is presenting this night for a room full of discriminating New York diners is based on the traditional foods of the Kalapuya people, whose ancestral homelands include the patch of Willamette Valley riverfront where Sybaris sits. Up until a year ago, Bennett didn’t know anything about the Kalapuya people or what they ate. And until Bennett got his hands on those foods, not even the descendants of those people—members of the Confederated Tribes of Grand Ronde—knew how good they could taste or how lovely they could look on a plate. 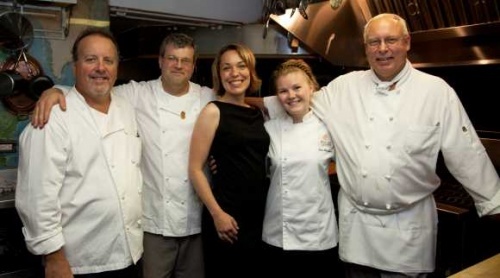 The dinner this night—September 30, 2011—is something new for the James Beard House as well. The four-story brownstone where Oregon native James Beard cooked and taught and wrote for twenty-six years is now, among other things, a performance space for guest chefs from throughout the United States and occasionally beyond—“the rising stars and those who have already risen and those who you can’t believe are still around,” as director of house programming Izabela Wojcik puts it. 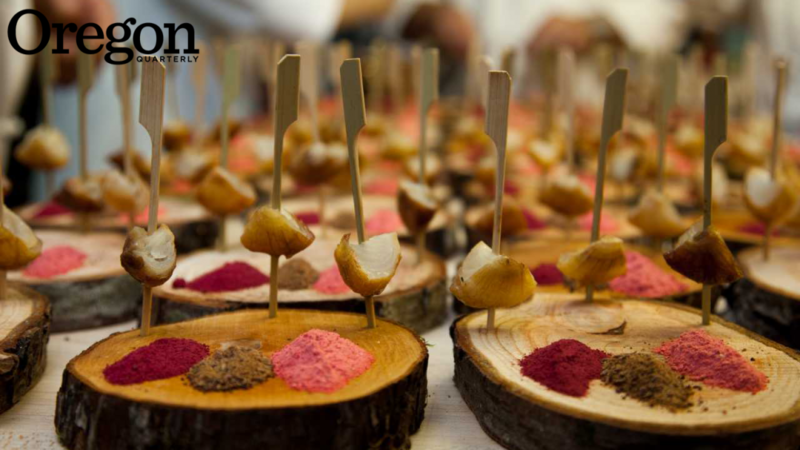 They come to show off the best of what’s cooking in their own restaurants and regions. But never before has a chef attempted to showcase what is arguably the most American food of all: the staples of a particular Native American tribe. Staples such as wild steelhead. “What’s that?” Wojcik had asked last spring when Bennett first called to sketch out his proposed menu. Beard himself would not have had to ask; he grew up in Portland and spent summers in Gearhart, eating and learning to cook the fish and shellfish, wild and cultivated fruits and vegetables of his home state. The cakes under the steelhead in Bennett’s appetizer were made of camas bulbs dug west of Albany, and the crème fraîche on top was flavored with yerba buena, a member of the mint family that grows wild throughout the Pacific Northwest. Bennett smoked the steelhead in Oregon using a technique he hoped would both honor the Kalapuya way with fish and please Easterners accustomed to cold-smoked salmon, laying the steelhead on blocks of ice while it smoked. Bennett has been working on this meal for months, assembling the camas and wapato, the yerba buena and biscuitroot, blanching and freezing the nettle shoots, procuring the venison and crayfish. It’s a meal whose story began nearly a year ago with a chef whose curiosity keeps him up nights reading food histories, whose commitment to community is well known in his adopted hometown. And it’s the story of the modern descendants of a Northwest tribe—a collection of tribes, really: a people who, after a century-and-a-half of oppression and dislocation and termination of their tribal status, have taken their revenge by regaining their status, building a successful casino, and establishing one of the most generous philanthropic organizations in Oregon. The threads of those stories began to intertwine last winter, when Bennett learned about efforts to preserve a natural area at Thornton Lake, on Albany’s north side, and to build what was being called the Kalapuya Nature Center. Fund-raising was under way, and Bennett immediately proposed a benefit dinner at Sybaris. It’s what he does: Bennett, who donates all the proceeds from every Thanksgiving dinner at Sybaris to the local agency that advocates for victims of child abuse, whose usual response to any community need is to hold a benefit meal of some kind. The menu for the Thornton Lake benefit dinner, Bennett knew immediately, should be built around the foods of the Kalapuya people—whoever they were. Bennett, raised and trained in the Detroit area—Michigan, that is—hadn’t a clue. So he phoned the offices of the Confederated Tribes of Grand Ronde, of which the Kalapuya is one. David Lewis, PhD ’09, manager of the tribes’ cultural resources program, sent Bennett a list of foods commonly eaten by people native to the Willamette Valley, and Bennett began working with his forager and other vendors who regularly supply Sybaris with locally grown foods. Then the fun started. 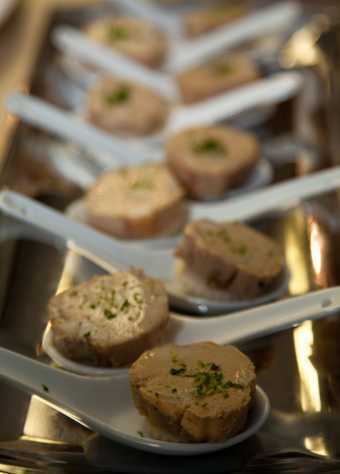 Using all his tools—mainly traditional French culinary techniques, with methods cherry-picked from other world cuisines—Bennett began experimenting with those foods to figure out how to prepare them in a manner that would please the eyes and taste buds of modern diners. The resulting dinner in April opened with a welcome and benediction of sorts from Tribal Council member Kathleen Tom and ended with an ovation for Bennett and his team, who emerged from the kitchen as dessert was being served. “Have you considered taking this meal to the Beard House?” one guest asked. It was a reasonable question. Bennett had cooked there once before, three years earlier—a “Taste of the Willamette Valley,” he called the menu, with dishes such as lamb with chanterelles and heirloom carrots, gathered greens with crab apple vinaigrette, and Oregon black truffle ice cream—and so was known to the Beard House staff. In fact, just two months before the April dinner, the Beard Foundation had named Bennett a semifinalist for 2011 Best Chef: Northwest, an honor bestowed on only twenty chefs from six Northwest states. 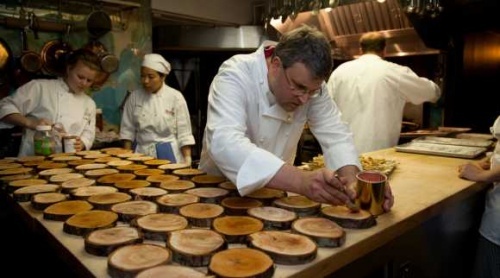 Bennett was the only Oregon chef from outside of Portland to make the list. But being unique, or even merely interesting, is also not enough to pull off a dinner like this. Particularly for a chef without a television presence, whose celebrity is mostly limited to Linn and Benton Counties, it’s not easy to tantalize enough New Yorkers. Even if you do fill the dining room, with patrons paying $170 a plate, such a dinner typically doesn’t pencil out for a chef—not after flying his team of four to New York and putting them up for three nights. Definitely not when nearly all the foods have been caught, gathered, picked, or dug by hand in swamps and fields and forests 2,500 miles away and packed into six large coolers checked as luggage on the flight out. That’s another way the Confederated Tribes were helpful. After getting the go-ahead from the Beard House for a September dinner, Bennett arranged a meeting at the tribes’ Portland office with Tom, Lewis, tribal member and wild foods expert Greg Archuleta ’84, and public affairs director Siobhan Taylor. To take the Kalapuya menu to a new level and a new audience, Bennett would need a sponsor. And he was seeking, for this second effort, a deeper understanding not only of the tribe’s traditional foodstuffs but of their preparation: how those foods were cooked, when, and why and where they were eaten. Lewis, too, was supportive. His work focuses more on the tribes’ educational programs, particularly the teaching of Chinook Wawa, the trade language that this disparate collection of tribes from throughout the Northwest used to communicate after being thrown together on a reservation in the middle of the Willlamette Valley in the 1850s. But revival of food traditions is another aspect of the cultural renaissance the tribes are pursuing and Lewis is helping to guide. He and Archuleta talked at length with Bennett about camas bulbs, traditionally a major source of carbohydrates for Northwest Indians, requiring a day or more of baking to be edible, and about wapato tubers, which Indians roast like potatoes after harvesting them from riverside swamps. Habitats for both plants, once abundant, have shrunk to a fraction of what they were prior to white settlement. It was Archuleta who recommended Bennett bake camas bulbs in a crock pot—the modern corollary to the earthen ovens the Kalapuya themselves used to use. He also wanted to learn more about the Kalapuya people and the tribes in general, and Lewis was happy to oblige; his UO doctoral dissertation focused on the 1954 termination of the Confederated Tribes of Grand Ronde. A decade-long effort to restore federal recognition met with success in 1983. Since then the tribes have experienced a profound change of fortunes. Their language and cultural traditions are being revived. And the overwhelming poverty that once characterized the reservation is gradually fading. Proceeds from the tribes’ Spirit Mountain Casino provide not only health care, education, and other benefits to tribal members but have funded, as of the end of 2011, grants totaling more than $55 million to a wide range of nonprofit organizations throughout western Oregon. This night’s dinner, following Beard House convention, begins with an informal appetizer course: guests wandering through the kitchen and—in fine weather—milling on the back patio with glasses of wine as appetizers are passed, mingling with Sybaris sommelier (and Bennett’s wife) Janel Bennett. Meanwhile, the chef and his team—Salem restaurateur Steve Morton, culinary instructor John Jarschke of Linn-Benton Community College, and Sybaris sous chef Irina Shalashova—are bumping elbows inside what Beard used to call his “grand piano”: a U-shaped counter at the heart of what is essentially an elaborate home kitchen. They are plating the first course: cipollini onions braised in duck fat, skewered for dipping into powered elk jerky and piles of pulverized, freeze-dried fruit, a dish Bennett calls “deconstructed pemmican.” The guests have by now trooped upstairs to the second-floor dining room—what was once Beard’s bedroom and private living-and-working area. As they wait for the first course to arrive, Kathleen Tom rises. Tom has traveled to New York to represent the tribes at the dinner and to help bridge the gap, with her presence, between past and present, as Bennett is attempting with his menu. She is a striking woman, more so with her necklaces of white dentalia shells and large beaded medallion and beaded earrings. Now she takes in the scene—a full house of diners poised to savor the traditional foods of her people, reconfigured, and gazing down from the wall, that icon of American cuisine, James Beard himself. Bonnie Henderson ’79, MA ’85, a Eugene writer, is the author of Strand: An Odyssey of Pacific Ocean Debris, a finalist for the 2009 Oregon Book Awards. Her last feature for Oregon Quarterly was “Beaver Believers” (Spring 2011).